With a goal to achieve maximum scores in EU trye labelling testing, this Pirelli P7 Cinturato Blue combines perfomance with enviornmental consideration in a way no other manufacturer has been able to thus far. Scoring top Marks in Wet braking perfomance and Rolling resistance throughout the Tyre size range this tyre will save you money for thousands of miles after you've left the Easywheels fitting station. With minimal rolling resistance you'll not only save on fuel but you'll have to replace you tyres even less, helping to save you even more money. 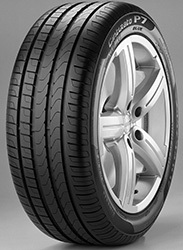 With low noise emissions and great perfomance in all conditons, this is a great eco friendly tyre without comprimise.